Kenya - Holly L. Lutz, Ph. D.
Working with Dr. Paul Webala and his students (see MSc student Beryl Makori's work here), I have been sampling a broad range of bat species for microbial symbionts and malaria-like haemosporidian parasites. Little is known about symbionts or haemosporidian diversity in east African bats, so with our surveys we target a broad range of habitats, from the coral coasts in Kilifi to the open dry savannah of Ol Jogi Wildlife Conservancy in Laikipia County, to the lush and chilly rainforest of Kakamega in the west, and down into a variety of caves, mines, buildings and outhouses. This work has already produced novel insights into the evolution of malarial parasites in vertebrate hosts, and we are just scratching the surface of microbial diversity in these amazing animals. Read more about the role of bats in the evolution of malarial parasites here! 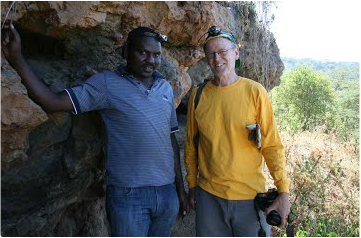 Among many collaborations between the Kenya Wildlife Service, National Museums of Kenya, and Field Museum of Natural History, the Bats of Kenya Project has emerged as a promising effort to scientifically document chiropteran diversity in Kenya. In addition to documenting species throughout Kenya, scientists working on this project are collecting data on echolocation calls, parasites, and pathogens. Learn more about Paul Webala's echolocation work by watching the Field Museum video below. Follow the project by clicking here! Bat calls from Kenya from The Field Museum on Vimeo. Paul has worked closely with communities throughout Kenya. 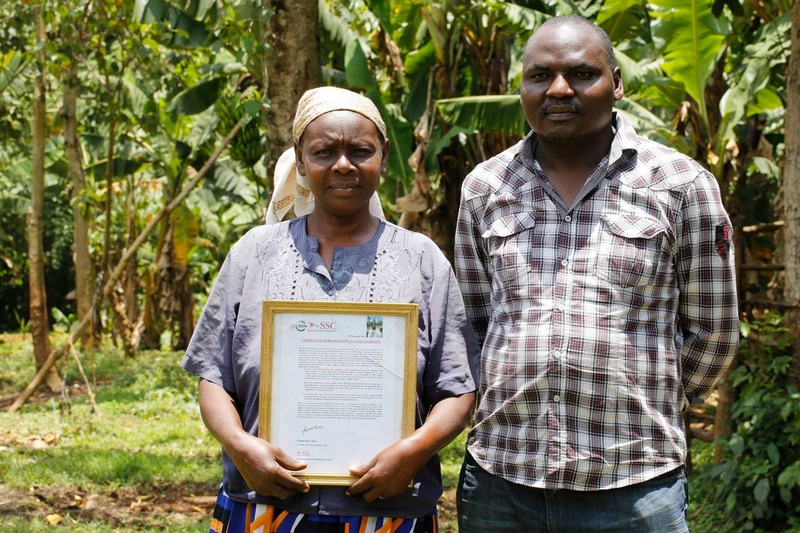 Here he is pictured with Ms. Beatrice Amadalo, who has been awarded a certificate of recognition as a "Bat Guardian" by the IUCN Species Survival Commission. Beatrice runs a farm that serves as the roosting site for a large colony containing many thousands of Straw-coloured fruit bats (Eidolon helvum). Allowing such a large colony of bats to roost safely over crops comes at a great financial cost to local farmers. It is not only economically costly, but can be torturously loud as well (just listen to the video below!). We owe great thanks to men and women like Beatrice and her husband who struggle under the weight of such sacrifices.